Stephen Scobie celebrates "the greatest film director of his age" with poetry exploring 44 of Godard's films. Subtle yet profound unities play from poem to poem. Characters, locations, images, and the generous use of quotation jump-cut and recur to send the imagination reeling through the larger works of both artists. 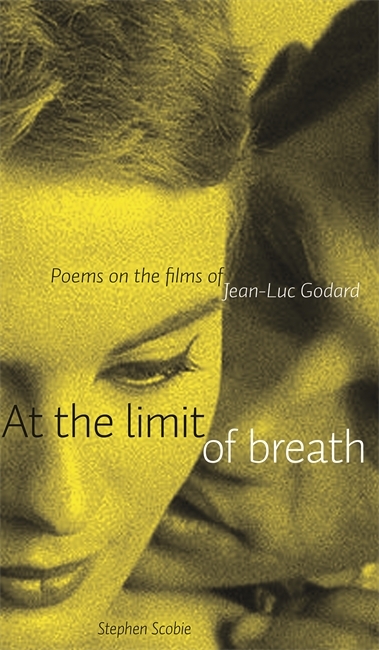 Readers will be seduced to linger within the writing and encouraged to seek beyond, to Godard's own oeuvre. The book is sharply envisioned and carefully cadenced so as to delight readers who may not be familiar with Godard's films. Those already acquainted with Godard's work will find At the limit of breath a most rewarding experience. Stephen Scobie was born in Scotland and has lived in Canada since 1965, teaching at the Universities of Alberta and Victoria. A widely published poet, he won the Governor General's Award in 1980 for McAlmon's Chinese Opera. He has also published extensively in the criticism of Canadian literature. He is a Fellow of the Royal Society of Canada. Stephen Scobie lives in Victoria.